I am extremely fatigued today. Completely wiped out. It happens occasionally. It's part and parcel of the auto-immune dysfunction I'm dealing with and it's happened before but I hate it so much. So much. First thing this morning I made a medium sized grocery run. I wasn't really feeling up to it but you reach a point where it's easier to go to the grocery store and pick up a few easy to prepare meals vs. trying to find the energy to prepare less easy to prepare meals. I bought a lot of fresh produce instead of the highly processed, highly preserved stuff. I prefer the taste of real food and I feel better when I eat real food. I'm broiling salmon tonight and doing a beef stir-fry tomorrow. The stir-fry goes a long way so it will make several meals. I bought more of my latest addiction - carrots and hummus - grapes and pears and juice. Trying to experience Better Living thru Farming rather than Better Living thru Pharmaceuticals. I'm still keeping an eye on the lack of process in Washington. Here's what stumps me: Our President is refusing to negotiate the financial feasibility of a bill that has already been passed yet he has cherry picked which companies do and don't have to participate... he has delayed the employer mandate while implementing the individual mandate... It's the constitutional duty of Congress to balance a budget. If Congress looks at legislation that is pending implementation that doesn't work with the budget, how can they pass a budget? Maybe I'm missing something. The Executive Branch of the government (the President) doesn't have the authority to nip and tuck a bill that has already been passed. Yet he does. In cousin news today... my cousin Lisa posted this on facebook. This is the reported experience of a friend of her with the healthcare.gov website. I haven't done any fact checking on this, I'm just passing along what I've heard. My kid is in New York City today. I am only slightly jealous of him because he's there to work and one of the jobs he's there to do is being impacted by a stagehand strike. Still... such a cool job he has... you never know where he's going to end up. For those who haven't been around - Ryan works for a company that installs and repairs organs. Musical organs. He also installs and wires up the speakers that go with these organs. He's done it since he was a teenager and he's very good at what he does. He installed the organ in the Tampa Hockey Arena... he goes to a lot of chapels and churches and just random places. It's a great job for a single guy except for the fact that it has him living in Pennsylvania and he has to go out of town a lot and be away from his gorgeous girlfriend, Sara. Have I ever shown you a picture of Sara? She's a doll. 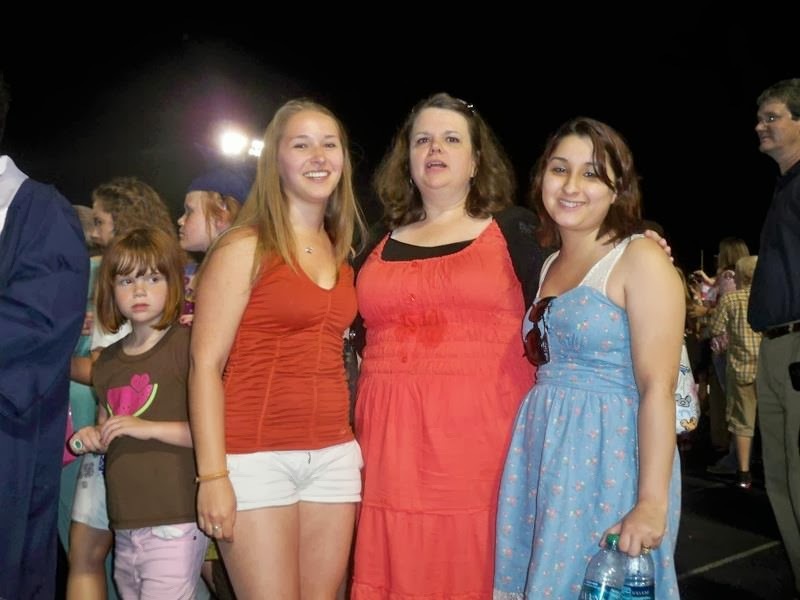 This is a really bad picture of me because it's after Austin's high school graduation and I was a sweaty mess - that spot on my dress? Sweat. It was hot. Sara's the blonde and Marquee is the brunette. I had to wait a long time for daughters and I really lucked out with these two. They're both working hard on getting their education so hopefully I'll have educated grandchildren. One day. Anyways... I was hoping Ryan could spend some time with his Uncle Bryan because I miss both of them so much and if I can't be with my family, I like knowing that my family can be together. I'm not sure that they were able to work out the logistics. 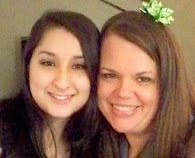 Also on facebook today... when I was a teenager there was a group of girls from my church that I spent most of my free time with - Susie, Andrea, Kim and Stacy. Once I got married (before high school graduation) they all sort of drifted out of my life. When Cody was in elementary school he and Kim's son were on the same baseball and football teams but it ended in a really unpleasant situation with her and I haven't spoken to her in... gosh, I don't know... maybe fifteen years. I recently (through facebook) was able to get back in touch with Susie who is now a grandma. Nothing shows you how much time has passed like your friends becoming grandparents. And then today Andrea posted funeral arrangements for her sister. I don't know how she passed... she's only 50. It doesn't seem right that our siblings would pass away. Makes me really sad. One of those mortality checks that reminds us that none of us are going to live forever. It turns out that the cost of Grandma's birthday party is less than what we see on the menu. That's happy news. Also happy news... leaves are changing color. We're only a week or two away from real fall color here. I finished a book last night that I've been reading at bedtime for about two weeks so now I'm back to reading the book I started reading two books ago. I have literary A.D.D. I found a Burt's Bees gift set on clearance at the grocery store today - I love Burt's Bees stuff but it's pricey. I got small sizes of five products and a new lip balm all for $6. Usually the lip balm by itself is $3. I also found these perfect little latte bowls/cups for a good price. Basically they're bowls with handles which is great when you take most of your meals in a recliner. (because sitting at the kitchen table hurts really bad). I remembered to buy a birthday card for my niece... now I just have to not lose it before her birthday. I found lighter weight cat litter - making disabled cat ladies everywhere happy. Little Kitty ate a bug today, earning his keep. And that's about all I've got today. Happy Wednesday, y'all. Love and hugs.